Would your company like to work with schools and colleges as part of your CSR strategy? Are you looking for a more unique and tailored opportunity? You can deliver staff development opportunities whilst benefiting local young people. Ed2Biz provides an essential brokerage service between schools and businesses. With Ed2Biz providing its expert project management each event can be tailored to provide the best experience for students and business. Students gain knowledge and experience of the world of work, opportunities available to them and the skills they need to be successful. Your team is given the appropriate framework, support and guidance to carry out activities within specified guidelines which provide the best outcomes for both students and businesses. This enables volunteers to experience the rewards from helping to raise the aspirations of young people to inspire and motivate them. 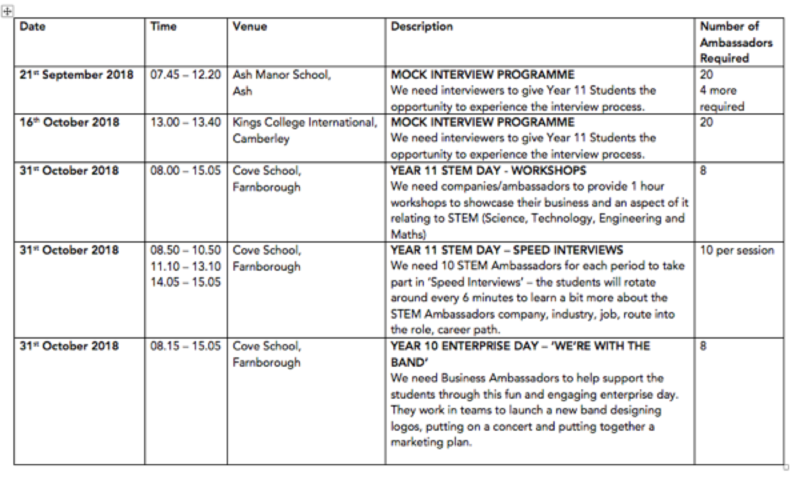 If you are interested in offering a bespoke opportunity for students to gain some skills and knowledge, which also supports your company message and ethos, please get in touch. Ed2Biz specialises in ensuring that your company's experience in helping young people prepare for the future is an investment for them and for you.